It is hard for me to go into the supermarkets here and spend so much for a can of pork and beans. First I know they are being produced in the US and then shipped all the way to Ecuador so that I can enjoy a can of Bush’s Baked Beans but the cost is so out of line, it’s beans for goodness sake not caviar. So I decided to make my own. 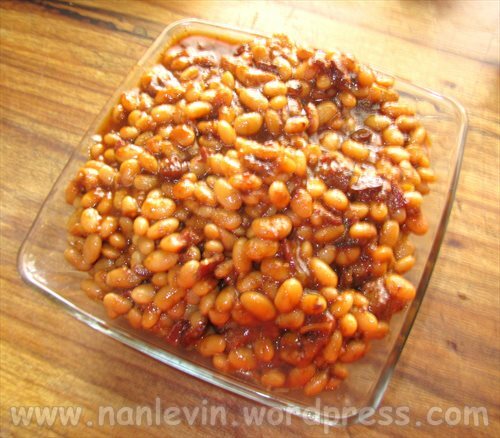 Today’s recipe is Boston Baked Beans. I did not do much planning ahead and I failed to soak the beans overnight so I am attempting the fast process of boiling the beans for several minutes and allowing them to soak in the hot liquid for one hour, I hope that works. But normally you would pick through your beans, wash them thoroughly, fill a container with water and allow to soak overnight before you would begin. Of course, I made modifications to suit me. This is what I started with and then I decided to add the following. Cut up the bacon and lardons and add to the pressure pot uncovered set on high heat. Cook until colored and crisp. Add the onions and sauté for just a few minutes to soften, then add your Habanero pepper and tomato sauce. Stir for a few moments to cook the rawness out of the tomato sauce and add the balance of the ingredients including the rinsed and drained presoaked beans. The stock or water should cover the beans by 1 inch. Lower the heat to a little above medium, secure the lid and place the pressure regulator on its stem. Bring the pressure up and allow to cook for 40 minutes with the pressure regulator rocking slowly, turn off the heat and stop the cooking by putting your pot into a sink with several inches of cold water. You may need to cook a little longer on the stove top a if the bean sauce is not the right consistency. You want a thick sauce. Well, they are done and delicious, I don’t think I will ever buy a can of beans again especially because it was not difficult or too time consuming. The taste is so much better than what you find in a can. Now if I could learn to can them. 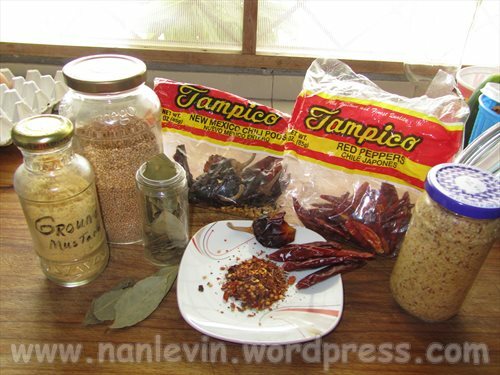 This entry was posted in Beach, Cooking, Ecuador, Food, San Clemente and tagged Alton Brown, Baked beans, Beach living, Boston Baked Beans, Ecuador, Expats, food, habanero pepper, San Clemente, South American by Nancy Levin. Bookmark the permalink. Your fresh pork and bacon look wonderful … I am so looking forward to eating such fresh good food in Ecuador. I will try your recipe … I also looks yummy. This looks really good, and much better than canned. Great find, and thanks for sharing! they look so good, much better than a can of bake beans. Thanks for the recipe ! Why can’t you can them in jars? B&M did them in bean pot shaped glass jars. They look absolutely yummy! I think the safe way is a hot water bath where the jars are processed, Nancy. Or freeze the jars of beans with head space. If you go to preservingfoodathome.com/tag/baked beans/ they advise a pressure canner and have a link to the US government site that gives very clear instructions. According to the original site he easiest way is to pressure can them … apparently the pressure canner costs between $100 and $200 but lasts forever. Good luck with this. Yum! Thanks for the recipe. 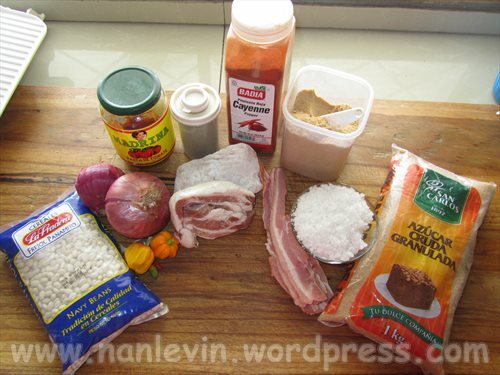 I’m going to make me some Boston Baked Beans. I brought a jar of molasses back from the states. I was going to use it to make gingerbread cookies, but I never got around to it. We can’t find molasses here, either. I love your recipe and am wondering if the sugar cakes are really a pre-processed molasses?? ?